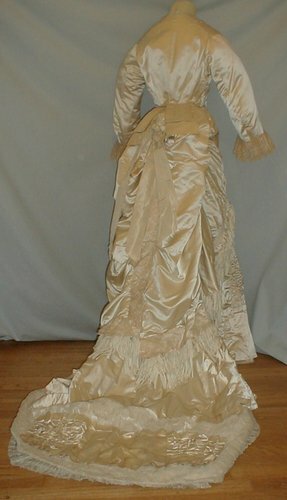 A majestic 1870’s champagne satin gown. 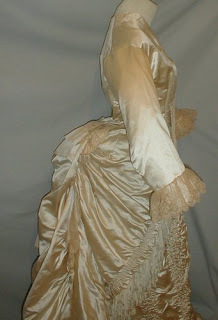 The dress is one piece and the bodice is attached to the back of the skirt. 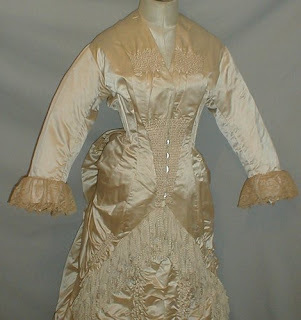 The dress is lavishly decorated with crimped ribbon trim. The front of the bodice is decorated with ruching. 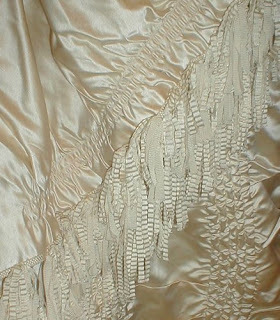 The sleeve cuffs are trimmed with lace flounces. The bodice is lined with cotton and has a hidden front button closure. The front of the skirt has rows of ruching. 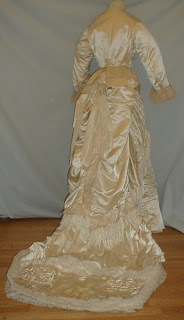 The dress has a bustled back and a long train. 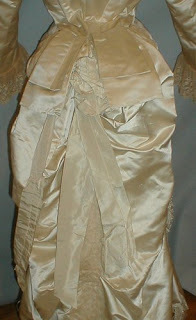 The back is trimmed with silk ribbon streamers and flounces of lace. The edge of the train is squared cut and trimmed with ruched netting. The skirt is lined in cotton. 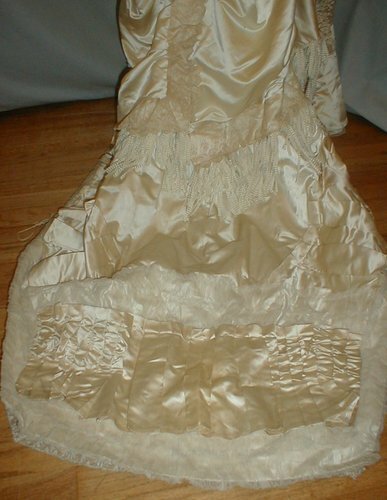 The dress is in very good and clean condition. There is a very faint mark of underarm discoloration and a couple of tiny splits under one arm. A magnificent display dress. Bust 36 Waist 28 Front skirt length 42 Back length 62. 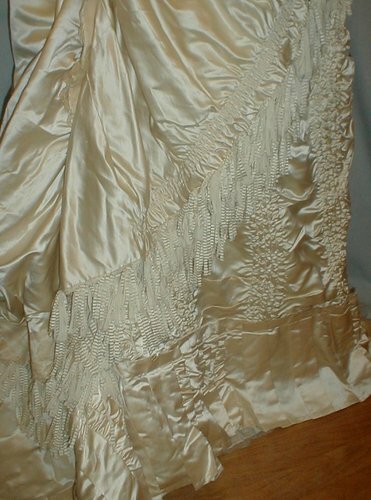 I'm a little hesitant to say it's a Wedding dress - partly because the seller didn't- but the train is a bit longer than usual for this era and the color is what would be considered the perfect color for a second wedding. I normally hate saying something is a wedding gown without proof but, in this case, I think it might be. I particularly like the ribbon fringe myself. :-) I can see making that for a dress in the future. 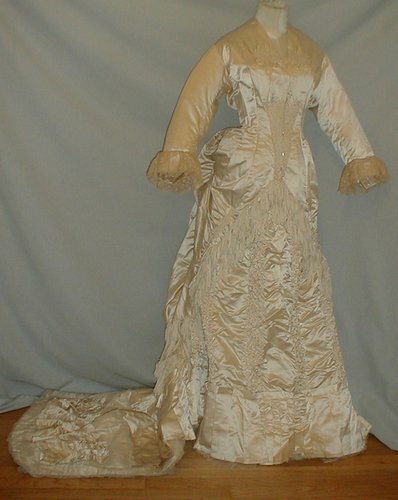 I just found your blog from the Time Traveling in Costume blog. What a neat idea to find all these garment and then tell interesting things about them. I will visit often. Thanks. Hello and welcome! Feel free to add your own thoughts to anything I post. I try to be good about responding.